With nature all around you here in the mountains, you’ll find plenty of options for engaging with the “natural world” in Northeast Georgia. The Chattahoochee National Forest encompasses most of the area, while several State Parks are definitely worth your time. The Chattahoochee-Oconee National Forests provide endless outdoor recreation opportunities and natural resources. 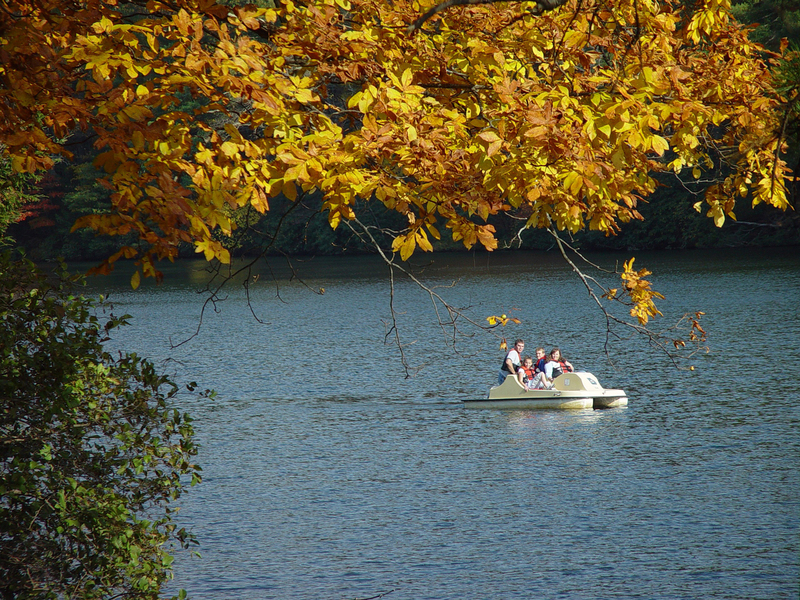 Featuring nearly 867,000 acres across 26 counties, thousands of miles of clear-running streams and rivers, approximately 850 miles of recreation trails, and dozens of campgrounds, picnic areas and other recreation activity opportunities, these lands are rich in natural scenery, history and culture. Originally, the Cherokee and Creek Indians made their home in Georgia from the 1500s until the early 1800s. When gold was discovered, Indians were driven off the land in the “Trail of Tears” to reservations in Oklahoma and their land was given away in land lotteries. Gold was mined and almost every stream in North Georgia suffered damage from hydraulic mining. When the gold ran out, timber, companies moved in to capitalize on a demand for lumber to build an industrializing nation. Much of the southern Appalachian mountains in the early 1900s were devastated by improper logging practices with no thought to reforestation. Many agricultural practices, such as deep plowing, planting the same crop year after year and burning crop litter, depleted soil nutrients and contributed to sediment in the streams. With the land worn out, much of North Georgia was land nobody wanted. In 1911, Congress passed the Weeks Law giving the government authority to purchase land from willing sellers to protect the headwaters of navigable streams and ensure a continuous supply of timber. The Forest Service purchased 31,000 acres in Fannin, Gilmer, Lumpkin and Union counties in 1911 from the Gennett family for $7 an acre. In the beginning, the Chattahoochee was part of the Nantahala and Cherokee National Forests in North Carolina and Tennessee. 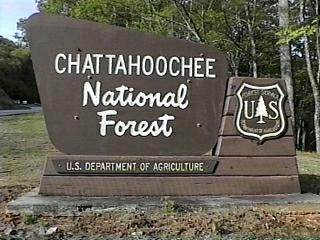 On July 9, 1936, President Franklin D. Roosevelt proclaimed the Chattahoochee a separate National Forest. The first task of the Forest Service was restoration. Help was received from the Civilian Conservation Corps (CCCs) in the 1930s. The CCC planted trees, built roads, did erosion control work, checked and controlled tree disease and insect infestations, fought forest fires, and built fire towers, ranger stations and recreation areas. The next four decades saw increased environmental legislation governing management of the national forests to protect environmental quality and ensure public involvement in the process. Wilderness areas were preserved, “Wild and Scenic Rivers” designated, and experts in natural resource management were employed to help meet the challenges. Today, Georgia’s national forests are a hiker’s paradise. Winding trails lead visitors through scenic mountains and rolling hills, by wild rushing rivers and cascading waterfalls. They also lead visitors through the history books: Spanish conquistador Hernando de Soto’s futile search for gold, the United States’ first frenzied gold rush; the Cherokee Indians’ struggle to hold on to their lands, and major battles of the Civil War. Across North Georgia, 10 wilderness areas, 1,367 miles of trout streams, and 430 miles of trails enrich the Chattahoochee National Forest. The famous 2,144-mile A ppalachian Trail begins at Springer Mountain and hardy hikers don’t see the end until they reach Maine! Don’t forget to stop at Brasstown Bald, Georgia’s highest peak at 4,784 feet. Trails traverse the mountain and the observation deck offers breathtaking panoramic views of mountains and valleys. 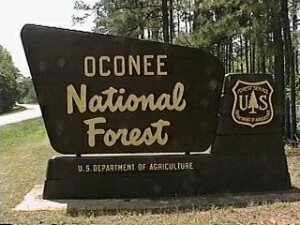 Unlike the tall peaks of the Chattahoochee, the Oconee National Forest is relatively flat with small hills. Visit Lake Sinclair, 15,300 acres of swimming, fishing, boating and camping. Near Lake Oconee, an easy 1-mile trail leads to one of Georgia’s ghost towns, Scull Shoals. The unique features of Georgia’s national forests make these lands a place of exploration and wonder. They are unique lands rich with recreation opportunities, history and spectacular scenery.